DVC Statement on Rezoning of Sahara Hotel/Ramada Inn into another parking lot. Demolition began on the Sahara Motor Hotel, May 12, 2010. It wil be completed this week. On August 12, a zoning hearing to change the usage status of the Sahara Hotel/Ramada Inn, where Downtown Voices Coalition and other concerned citizens were hoping to voice their discontent with making an existing vintage motor hotel into a “temporary” parking lot, was continued by the City. We firmly believe that our statements led to this continuance, and by the time the rescheduled hearing on August 26th occurs, the demolition will be complete and our statements will be moot. Nevertheless, the Downtown Voices Coalition wants to make their statement available to the public, to help spread the word about this ridiculous decision being taken by the City of Phoenix. I’m speaking today for the Downtown Voices Coalition, an organization that includes small business owners, artists, historic preservationists, housing advocates, developers and other Phoenix stakeholders, all striving for a better downtown for residents and visitors. One of our developer members finds it difficult to convince people to bring new projects to the downtown, especially when driving them through large swaths of empty, unused land and rows of asphalt parking lots. Investors are suspicious of a city’s progressiveness when it spends more time and money on land banking and demolition than creative and adaptive development. The Sheraton is a city-owned and constructed hotel. If it wasn’t built with enough parking to accommodate its users, this should be fixed creatively, not destructively. A future ASU project on the site could be worked into the existing vintage structure, utilizing skills hopefully taught at its own architecture school. There is also still private-sector potential for adaptive re-use, even with the initial demolition, to make something more of the property than mere asphalt and land-fill. Therefore, Downtown Voices Coalition asks you to deny the re-zoning and help us to hit the reset button on this demolition. If the current city administration doesn’t have the foresight to consider the alternatives, it should at least be saved for ideas from a future and more visionary group of planners. 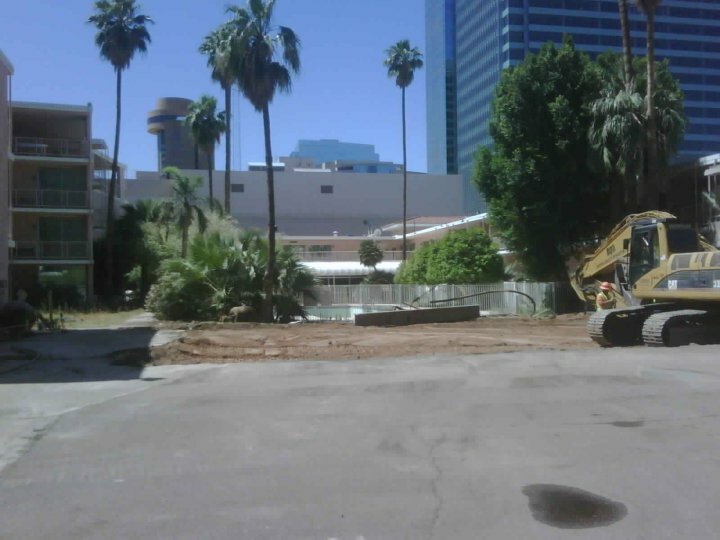 Posted on August 23, 2010, in Downtown Voices Coalition and tagged ALERT!, ASU, City of Phoenix, Demolition, Downtown Phoenix, Downtown Voices Coalition, Historic Preservation, Ramada Inn, Sahara Hotel, Sahara Motor Inn, Sheraton Hotel. Bookmark the permalink. Leave a comment.